As I sat down to write a post about Texas chili, I realized I had no funny or memorable stories about chili. Except have you ever noticed that there is no other dish that inspires so many contests among amateur cooks? When I was a cub reporter at The Tampa Tribune, we had a chili contest among the reporters in the Brandon Bureau. A clerk won with a version that had cinnamon in it. He claimed to have never made chili before. At the City Paper, we had a chili contest every year. The winner, also, usually claimed to have never made it before. There was a big stink one year when Dom Bonvissuto won after his mother talked him through her chili recipe. The sore losers thought that was cheating. I personally think it was inspired. I am not a chili snob. I will eat almost anyone’s chili and enjoy it. I like the chili at Krystal’s and am very partial to the chili five-way at Steak ‘n Shake. I like chili with cornbread or corn sticks and I like it with just soda crackers crumbled on top. But the chili I like best, the one that towers over all other chili versions, in my opinion, is Nancy O’Hara’s Texas chili. Nancy is a friend of our next door neighbors. One night we were invited for supper and Nancy brought her Texas chili. It is not made with ground beef and it has no beans. It is made with a boneless chuck roast and just a few other ingredients. Really, at the end of the day, I think it’s more of a stew and I serve it over rice or mashed potatoes. But it would be killer over spaghetti with some chopped raw onion and shredded cheese. In a large Dutch oven, cook bacon over medium heat until crisp. Add onion and cook until soft. Add garlic, chili powder, cumin, oregano and salt. Cook for 30 seconds. Add beef and enough water to cover it. Simmer, uncovered, adding more water as necessary for 2 ½ to 3 hours or until beef is tender. Thicken the sauce with cornmeal. I’m with you, I love a good chili. The only time I become snobish is when people think that the hotter they make the chili, the higher it should rank in a contest. 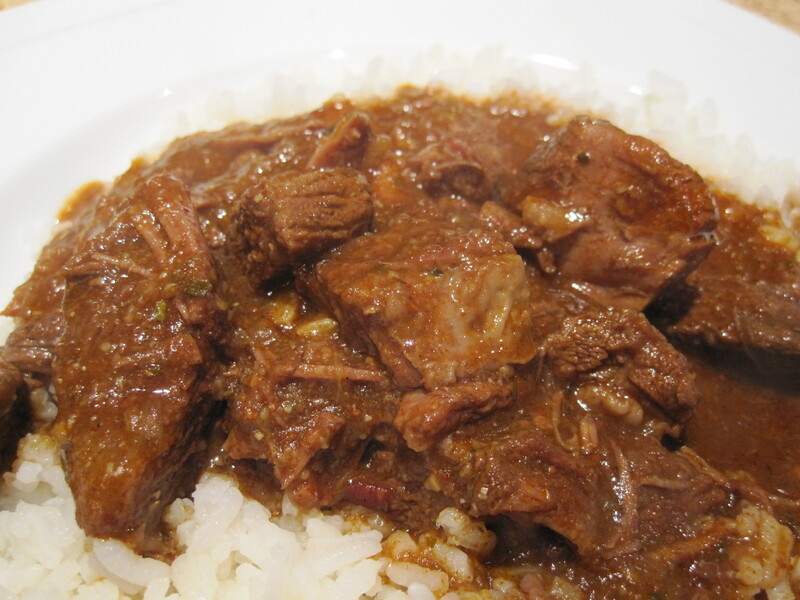 I love the simple flavors of beef, cumin, chili powder….etc. This Texas born girl says Whoooooheeee and thanks for a true Texas chili recipe. Like you, I’ll eat anyone’s chili. I just do love the chili of my childhood. LaFonda’s restaurant on Broadway. Sounds the same. Mmmmm.